A great man once said, “It is no small thing to make a new world.” And he’s only really half-right. It is a rather small thing to make a new world in one’s head. It is an entirely larger accomplishment if one delivers on the artistic and philosophical promise of this new world. So while, yes, The Surrogates film starring Bruce Willis may have been a bit of a letdown, Robert Venditti’s consummate vision of a strikingly modernist post-modern future still vibrantly successful, in no small part to his recent prequel The Surrogates: Flesh and Bone. 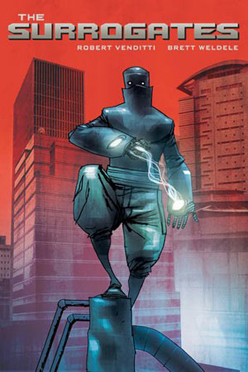 Begun in a mini-series published by Top Shelf in 2005, Venditti’s The Surrogates quite dutifully reimagines the Yeatsian postmodern societal disintegration in a world in which people do away with their physical selves in preference to beautiful idealized androids, which they then live vicariously through. In the first series, Atlanta has already been taken under the spell of this corporate wundermachina; Detective Harvey Greer, the main character, never even sees his wife physically to have dinner. Despite its simple premise, Venditti achieves a contemporary ethos which holds a mirror up to a reality-show culture, summoning the most biting fable of American socio-cultural trends in recent memory. What is most impressive is not that the story is soundly constructed, but how vast an area of area of the American mindscape the story encompasses, yet how personal it feels. These poignant narrative techniques evince the abilities of a great storyteller in the making. I spoke to Venditti from his home in Georgia, and was delighted to find an open-minded and cordial man who, ironically against his traditional upbringing in the American South, manages to breathe new life into the old “Android” science-fiction trope, partly by blending it with that underused juxtaposition: religion. While it is impossible to deny the religious undertones associated with the characters who eventually serve as series’ antagonists, The Prophet and The Steeplejack, what I found most refreshing about their portrayal is the complexity with which they are situated in their respective positions in society. Disney made a mistake in changing the story to include mass-death; the comics feel much closer to reality and more innovated due to their realistic portrayal of human reaction to such phenomena as terrorism, violence and the disconnection of identity of the postmodern world. Despite the fact that Venditti does not come from a tradition of comic authors of any kind, his storytelling is ultimately sound. Flesh and Bone, ostensibly a tale of social rapture and the beginnings of a dystopian America, feels like Venditti is in his element. Atlanta serves as a useful petri dish for the examination of the logical conclusions of contemporary perceptions of identity, providing an appropriate backdrop of materialist culture, which does not seem to value or even remember the purpose and value of the human soul. Patrolman Greer in his younger incarnation walks through a world in which the Surrogates are initially the playthings of a gang of misanthropic children—a useful metaphor for the problems the Western world currently appears to be facing. The story expands its scope to encompass relationships of cause and effect in all walks of life, ultimately coming together to form a Dickensian world run on pathos, far from the shores of its Asimovian predecessors yet unexpectedly, and delightfully, serving as something a younger cousin. In this interview, I tried to strike a balance between Venditti’s background and his opinions. I hope you will find it a useful look into a unique, emerging talent in the industry. I’ve noticed that some or your fictional theories are similar to those of inventor Raymond Kurzweil. You both seem to believe in the escalating development of technology. One of the more obsessive things he has is a timeline of what he thinks will happen as technology advances in the world for the next hundred year. I thought it was interesting in the way that it paralleled what you want to say. Since writing the book, I thought that the technology of The Surrogates is going to be probably real, and its going to exist much earlier in the future than 50 years from now that I posit. I mean I get forwarded all these stories from fans. There’s a professor in Japan who doesn’t want to deal with the morning commute so he has an android version of himself that’s in the classroom. He connects to it virtually and teaches class through this robotic dummy of himself. Somebody else sent me an article from Sweden where, because the living centers are so far apart from each other, they are working on technology where a doctor can remotely commute to a hospital in another city and perform a crucial surgery through robotic arms by controlling them with thought. They could be performed in time and not have to worry about flying in doctors. The technology looks like it’s definitely coming along faster than I thought it would. One way I thought you portrayed this very interestingly in The Surrogates is through its impact upon human relationships. You’ve said that Margaret and Harvey’s relationship is the backbone of the story. What do you think this has to do with the separation of reality that comes with the virtual life? I think its all about identity and the anonymity you get from technology: text messaging, chat rooms, World of Warcraft, Second Life, any of those kinds of things that allows you to create yourself as you want to be. The biggest impact is upon how we perceive others perceive ourselves. [Chuckles] It is a big impact, and I think there is a breakdown in personal communication. That’s why I’ve always felt that the relationship between Harvey and Margaret is really the backbone of The Surrogates story and, to me, the most important element. It gives you that personal aspect and shows you, if this technology of Surrogate machines really existed, how it could even invade the home at that point. In other words, right now if I’m living through Second Life or interacting through chat rooms or whatever, I’m still me in my home. In my little bubble, I’m still me and when I interact with my family and my neighbors, that’s still me. But if you had a Surrogate, and you did as Margaret does, since you use that even in the home… well, now its even breaking down the family unit. Whereas now, the lack of personal relationships exists, the effect is more on the level of perhaps professional relationships—telecommuting to work or really relationships with people you never would have had in the first place—with a Surrogate, it would really come in at a much more personal level and get to us in our daily lives. One thing I was really touched by in your characterizations was the portrayal of Margaret. Margaret is the wife of the main detective, Harvey, who has primarily used a Surrogate for years now. She is afraid of even getting out of her bed. Do you see this as a common malady in your postmodern world structure? Margaret’s sense of character, where she’s coming from… I think I was looking more at body image aspects, which are felt more acutely by women. You’re bombarded if you’re a women, with magazine covers and TV shows and everything is about how you look. At least that’s the way things are presented to you in the media and popular culture. I don’t know if its necessarily a fear, like its not some kind of xenophobia. She just doesn’t want to face the realities of the fact that her body image is no longer what society would determine it needed to be for her to pass muster and she’s trying to stave that off in any way she can. I guess she’s trying to go for that singularity that you said Kurzweil does but for very different reasons. Whereas Kurzweil is trying to reach immortality and it doesn’t really matter what his age in years is, Margaret just wants to stay young. A lot of that was borne out of what was going on at the time, which is certainly carrying forward into today. You have a lot of these shows, extreme makeovers and kinds of things where people go in these radical plastic surgery procedures to revamp the way they look, and they come out at the end and they’ve got a new haircut a new clothes and new teeth and the crowd claps for them like all of a sudden they are acceptable people, which they weren’t before or something. That’s a lot of what goes into Margaret’s character. A lot of what The Surrogates is about is “where does the line get drawn between what’s right and what’s too much?” There’s the technology aspect of that to the story: “where does it become good, and where does it become bad?”, similar to plastic surgery. I think that no one has a problem with a burn victim or somebody born with a cleft pallet undergoing plastic surgery, but it’s looked at differently if its something like breast implants. Why is one OK and not the other? I mean I understand the realities of the sense that one is different, but when you get down to the basic philosophy of it, they are still really about physical appearance and image. I don’t know the answer to that question; I don’t know where the line is drawn. It can also be read as a take on the classic superhero epic, the characters taking up the dichotomy of good and evil, order and chaos. In that same way where there are gray areas, I don’t think that there’s good and evil necessarily either. I think that Steeplejack and certainly the Prophet; I don’t think you can say they are entirely good or entirely evil. It depends on how you are coming to the question and how you choose to answer it for yourself: where that line in technology gets drawn. That’s where you’re going to come down on who’s the good guy and who’s the bad guy in the story. You know, I think even Harvey whose a police man and who’s certainly the hero of the story—and I guess you would classify him as a good character rather than an evil one—he’s not beyond sympathizing with the “quote unquote” villains of the story. Its something that I really try to go for in everything that I write. That I don’t ever want to feel like I’m asserting… I feel like in a lot of comics and a lot of art in general you get the sense that the writer or musician or whoever is telling you what they think and how you’re suppose to think. It’s like they are preaching at you, you know. I don’t ever want to do that. I always want to present my stories in a way where the audience is leaving it up to themselves. I’ve had just as many people interview me and say “wow you must really hate technology” and say “wow you must really dig technology”. And I like that [chuckles] because in a sense I made it so people don’t really know where I’m coming from just from reading my book. And that’s what I want. I want them to come to the answers themselves. Well, if I may say so, I think you make Steeplejack the perfect villain if that’s what you’re going for, because not only is he going completely all out against our heroes, he’s also an admirable human being. You know, you’re giving it a little bit of this imagery in which Steeplejack, who has basically imposed his view upon the world is now trying to take it back. I can’t help but notice the Christ imagery in that. Oh yeah, definitely. Kudos to you [laughs], you can mark this down. I think you are the first person to ever approach the religious undertones of the book to me at all, which I find astounding because I always thought it was a very big part of the story. It’s funny you say that, pointing to the Christlike aspect of it. I think that’s a through line that runs through a few of the characters and you also get a sense of that in the new book that’s coming out as well. We go into it a little bit deeper, where you see the Prophet building up his Church. You know it’s funny. In the original draft of the story, just when it was in script form, I had done some things, Jeez, I’m going to try to do this without giving up some spoilers I tried to do some stuff where the original prototype Surrogate, the ones that all the others are based upon, it actually had a name and the name of that Surrogate was Adam. Right? How clichéed is that? [laughs]. I also thought about some things where [the character of] Lionel Canter, coming up with his name, originally his name was going to be Emmanuel because Emmanuel is a name they use to refer to Christ in the Bible. As I was writing the story this religious undertone was something that was kicking around in my head the whole time and those were unsuccessful ways I was going to evoke that and I edited them out because they weren’t working. But it just sort of shows the process that I was writing it that kind of imagery you were referring to and those kind of analogies was something I was very conscious of. I love that essence that he’s got. I think that’s why so many artists have been able to take the ball and run with it. Well something that’s always appealing; when you’re reading a story and you have this voice crying out in the wilderness. When you have this one person raging against a society for benevolent reasons, I think those stories are very attractive. [Alan Moore and David Lloyd's] V for Vendetta would be one that comes to mind. I certainly don’t agree with some of political points of that book necessarily, but I think V is a great character for that reason. I mean you just love a guy who’s out there, laying it all on the line, and completely alone. He’s trying to change things, to make them better or to what he perceives to be better, and I think those are very attractive characters. I always wanted to do a character like that, so I did. I can’t say enough about the art. It’s very color driven—Weldele, even though he’s modern, is very old school. Do you think that your narrative had any impact upon that art? Brett has a very expressionistic style. I felt—Chris Staros felt first because he’s the one that brought him in. He had a great style, that sketchiness he has, for whatever reason, evokes in me the cyberpunk feeling I was trying to go with in the book. I also felt, the way he renders characters, because they are so sketchy, they are not hyper-detailed, they all look like iconic representations of themselves. I think that helps play into the idea of the Surrogates too. There’s this scene, you go somebody’s nice penthouse apartment, you meet their butler, and the Butler’s kind of sketchily drawn but he looks like a Butler. He’s got the iconic traits that an “Alfred” like butler would have. I think this plays into the story because, not that people might think this when they see that butler, but my intent is, when you see that butler to think who it is on the other side of that Butler’s surrogate. Is that really an old guy with an old butler’s Surrogate, or is that a young guy who wants this really good-paying job as a butler to this rich guy in this penthouse so he went and got this old butler’s surrogate? In a future where everyone lives through these idealized versions of what you think they are supposed to look like, all of the stereotypes would be reinforced. At one time it would become extremely egalitarian, because there would be access for anyone who could afford a surrogate to do whatever they wanted, because they would all look the part. By reinforcing stereotypes, it actually breaks the stereotypes down in a weird sort of way. That’s sort of something I wanted to play around with in the book. Your character the Prophet is the symbol in the book for a world without Surrogates. Despite operating as a religious prophet, some of your material in the book reveals that he actually killed his family. How could a criminal become a prophet, I don’t get it? If you believe in the Judeo-Christian faith, look at Saul. He was on the road to Damascus. He was one of the worst persecutors of Christians, and all of a sudden the scales fall from his eyes, and he becomes the apostle Paul. All sins can be forgiven if you turn to Christ, and I think that’s what the Christian faith teaches. I don’t think that his past, those events that happened, whether or not he did intentionally kill his family, is matter which I don’t think is definitively resolved. Even if he did, according to the tenants of the Christian Faith and of his followers, him turning to Christ would [allow it so] those things have no bearing on that. They don’t prevent you from becoming a Prophet just because you did bad things in your past. The Prophet even has his own legal seat of power. That’s another issue: in the world where nothing is real, political power seems to have finally been successfully localized. Federal government and state government do not seem to be dwarfed in power to the municipal government. How does that happen in a world like this? I didn’t really get bogged down in the politics much. In our current governmental structure, it’s a big territorial dispute. Cities fight with state governments, state governments fight with the federal government. Everyone wants more power and everybody wants to handle things on their own and not have somebody come in and check the forms. 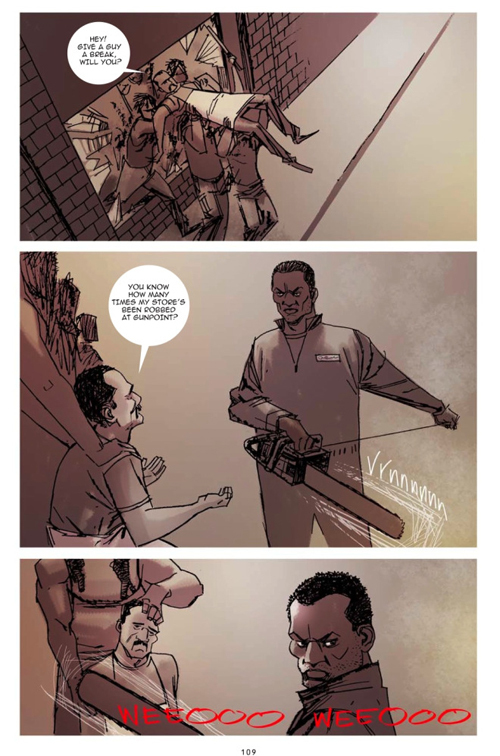 Having it set in a future version of Atlanta, I could have had the governor settle the dispute at the end and not the mayor because in Atlanta, the governor and the Mayor live in the same city. I just wrote it the way I did and I didn’t really dwell on these things a heck of a lot. Gender roles within society are being addressed in the value system and legislation in the US. I’m referring to a case in which an eight-year-old, biologically born male, has declared herself a female. In what way do you think technology in The Surrogates addresses these heated issues? For a political science course I took in college, I read a book called Taking Sides. The book was set up in groups of two essays in each chapter, and they would discuss a policy subject, whether it was the environment or one of these things. You’d read one essay from a guy who was for it, and another essay there was a guy who was against it; you’d read them back to back. That was a day, reading that book, that I learned that arguments can be very convincing no matter which side they come down on because you’d read the first essay and go, “man, I am totally for that!” and then you’d read the second essay and go “now I’m totally against that.” By presenting facts and opinions in a certain way, you can shape these journal articles that you’re writing to reach these biases that you want the people to agree with you on. So when I wrote that mock-journal article that you’re talking about, that isn’t me the writer talking about that. That is William Lazlow, this future scholar writing this journal article, trying to convince the reader how awesome surrogate technology is. So when he says how awesome it is that females can be pilots now, because all they have to do is go get a male surrogate, because customers are more comfortable according to the statistics with males being pilots over females—again this is in a future world, I don’t know if these statistics are based in reality today I’m making all this up. Does that really solve the problem of sexism? I don’t think it does. I’m not a women who has ever tried to get a job as a pilot, but if I was, and I was told I could be a pilot, and all I’d have to do is be a guy, I would probably be offended by that. I don’t know that actually having a Surrogate would solve any of those identity issues, but again I’m not somebody who’s dealing with any of those issues, so I don’t know that I could say. What can you say about your statement about the economy, the materialism of it? You read a lot of stories about utopias, obviously this is something that’s been done a million times where you’ve got this world where this technology has come in and taken over, everybody’s a part of it but there’s always going to be some faction of society that’s going to be left out of it either because they don’t want to participate or because they just plain can’t. What do you do in this future where everyone needs to have a Surrogate and you want to go get a job but they’re not hiring people who don’t have Surrogates because, “I’m an armored car service and I don’t hired somebody who doesn’t have a Surrogate because it’s a lot cheaper for me to insure equipment than it would be to insure a human being behind the wheel, so I’m not going to hire you, you don’t have a Surrogate.” But then you can’t get a Surrogate because you don’t have a job. It would become this vicious cycle to be involved in that society, so that’s where the Dreads come from. Some of them are opposed to this Surrogate technology for religious reasons, or they just don’t want to use it, but there’s a group of them that- they can’t. They’ve just been locked out of this world. Economically, I think that’s probably the way that would go down. You’re always going to have these people that can’t take part. That’s one of the points I think you’re making. In a world where nothing is real, almost anything can seem be reasonable. In your story, everybody is very reasonable, even people we might disagree with. I think that’s very true. I really wanted to have the story so that you could sympathize with everybody in it, no matter who it is. I mean it’s funny because The Surrogates can be read as a critique on materialist capitalism, yet DisneyCorp is making the movie. [Chuckles] I don’t have a problem with Disney making the movie. I know Disney gets a bad rap for whatever reason, a lot of people like to bang on Disney, but they’re all the same to me. I don’t mean that in a bad way. They’re all big companies and they’re all just out there doing their business. I’m fine with Disney, I’m happy to have them. The Touchstone imprint is nice and I guess if it were Disney proper, I would have been a little more worried only because [I think that Disney proper] only makes G-rated movies and I don’t think that The Surrogates is a G story. With it being on the Touchstone imprint and being PG 13 I’m totally fine with that. I was very, very happy to have the film people involved, so it doesn’t bother me at all. In many ways you are part of a growing trend of having comic book creators having their work adapted into movies and television. You have Brian K. Vaughan whose written on Lost. You have Jeph Loeb’s infamous involvement with Heroes. It’s a major part of the culture. I think I just got into it at the right time. So much of it is just dumb luck—you’re in the right place at the right time—and I think I just got into comics at a time they were becoming really popular and they were getting some wider recognition in culture and more power to those guys. Brian K. Vaughan is a great writer, I love his stuff. Me personally, I don’t really have a desire to do teleplays or screenplays right now. I’m very happy writing comics but I’m happy that those guys have reached the success that they have. I think it’s great. I think there are a lot of things about the comics medium that are appealing to wider audiences and now that comics are getting that kind of exposure I think that’s being borne out. It’s a very immersive experience, the comic book. 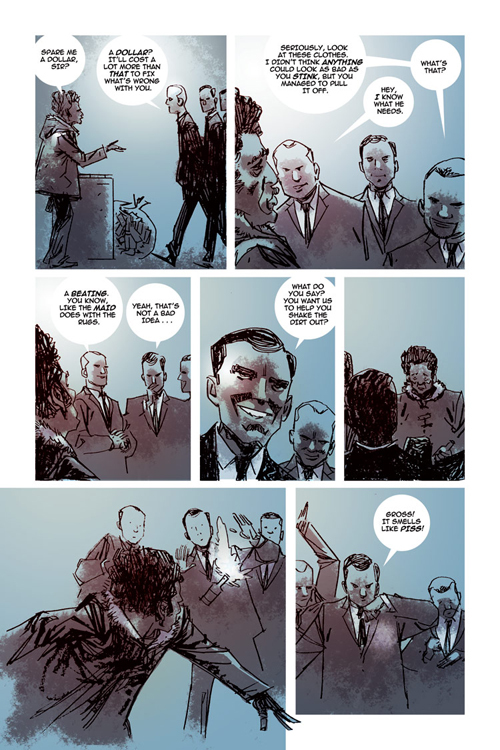 It combines the sequential narrative and pictures, while still involving imagination to move your eye across the panels and necessitating the reading of the words. There are a lot of things in comics that are very basic to us. If you go back through the history of art, all the way back to the cave paintings, sequential art has always been with us. There must be something about it that is imprinted upon our consciousness and I think that people are starting to come around that way. I like the way that Harvey says in the original book, “I’m just not going to wear the surrogate again,” after it’s destroyed. Does your new prequel, Flesh and Bone, give any insight into his mindset? There are practical reasons why we would have Surrogates too, and Harvey falls into that category. As a cop, he wants to have a surrogate so he can avoid getting hurt while he’s at work. I think in some ways that what started out to him as a practical idea to use a surrogate as a bullet-proof-vest to protect his real self. It ended up becoming something that took over his life in a much larger way, and I think that’s what technology does. You can get sucked into it so easily and then suddenly—Boom! You’re just totally immersed in it and before you even realize it it’s just there, and it’s taken over. I think that’s they way it was for Harvey. What started out as something very practical and logical and sensible—and his surrogate even looks like his actual self, except for the differences that have taken place of the course of his aging while using a Surrogate—has ended up becoming something much more pervasive in his life. I’ve got about three Surrogates books in my head. One is the third book in the trilogy, this core trilogy I had an idea of when I first envisioned the story and that would take place after volume 1. The other two that I have an idea of right now would take place in between the prequel and volume one, which is utterly confusing to have a prequel before volume one but, you know, that’s the hand I dealt myself. Aside from that, yeah, I’ve got a few things I’m working on. I’m working on a few graphic novel adaptations right now for Hyperion books. 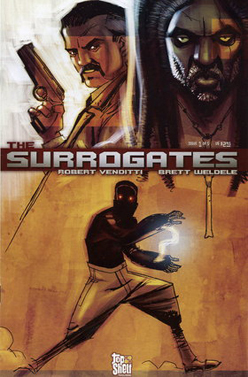 Most people have never heard of it, it’s a Disney-owned company They had never heard of The Surrogates and didn’t know there was a Surrogates film when I met them. I also have another graphic novel coming out from Top Shelf, summer 2010. It’s not sci-fi at all it’s more of a modern day political/medical thriller which is much closer to what my background and my interests are—like I said, I’m not really much of a sci-fi guy. What about the sci-fi genre compelled you to write this story? It’s an idea that I had that had to be sci-fi. It’s a future world that is using technology which doesn’t exist yet. To me, that meant that it had to be a sci-fi idea. I think that sci-fi is great in it’s inherent ability to put you in a world that doesn’t exist, and make it believable and therefore make you realize how real and how plausible something can be even when it doesn’t exist. I think that’s a great trait in the sci-fi I’ve been lucky enough to read. The few books I’ve read I’ve been lucky enough that they were the really good ones; 1984, Brave New World, where there’s this world which seemed completely implausible at the time but here we are, down into the future, several decades from when those books were written, and those futures seem very realistic now. I think Friday Night Lights is a great show. Probably the most realistic family unit I’ve ever really seen on TV. I think it’s a really well done show. I like to watch that new Southland show, I enjoy that one a lot. I like that new Castle show. It has a Moonlighting vibe to it. Even though I was very young when Moonlighting was on TV, it’s still a show that I really like. Bruce Willis was cool and the whole thing going on with him an Cybil Shepherd was really entertaining. That and the news. What it’s like knowing that Bruce Willis is going to portray your character? It’s no lie. When I wrote the book back in 2002 and we didn’t even have a publisher yet, my wife and I were hanging around one night, talking about “if they were going to make a movie about this, who would you want to play or cast,” just total pie-in-the-sky kind of stuff. We both thought that Bruce Willis would be the perfect Harvey. He’s one of those guys who can do the action stuff and be also be convincing in what would be the heart of the story which would be Harvey and Margaret. We needed an actor who could be tough and yet bring home that personal element as well. When they ended up casting him five or six years later it was crazy. What do you say at that point? You just sit back and enjoy it, I guess. What are you going to do when the Surrogates lunch boxes come out? I’m going to go make a lunch and pack it in it [chuckles]. I write the books, and let everyone else do the things that they want to do… it’s all good with me. If I get to have a Steeplejack lunch box I would be one happy guy. The funny thing is, we might never meet. So… are WE now THE SURROGATES? [Laughs] we are. We are living our lives virtually! I work out of my house. Brett Weldele drew the book, and to this day I think I’ve probably been in the same room as him maybe four times, once a year at Comic-Con and when we visited the set in Boston. We are very much living these lives removed from ourselves, so the interview is very self-referential in that regard.